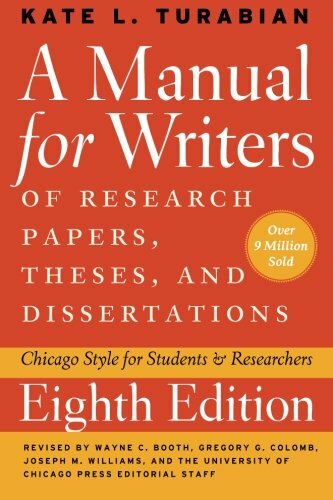 The Turabian style is a citing and referencing system based on the Chicago style and named after Kate Turabian, from the University of Chicago, who authored a manual to guide students in citing and referencing when writing research papers. The print manual is available from all Monash libraries. 1. Notes - Bibliography Style: This style has a superscript number in the text and a footnote at the bottom of the page, as well as a bibliography at the end of the document. 2. Author - Date: In author-date style, you signal that you have used a source by placing a parenthetical author date citation, e.g. (Smith 2011) within the body of your document. There is also a bibliography at the end of the document. Please refer to the left-hand navigation menu for specific information on how to reference different types of sources, e.g. books, journals, websites and images. Full source information (author, title, publication details, page numbers) is given in a correspondingly numbered note. Full source details are given the first time a source is noted but abbreviated in subsequent references. Use Ibid. (a Latin term meaning "in the same place") for a source repeated directly after the one before. Use a shortened form when a source is subsequently repeated (but not consecutively). Notes may be used for commentary on the cited sources or other substantive information on the text. List all your sources at the end of your document in a bibliography. The bibliography includes every source you cited in a note and may include others you consulted but did not cite. The bibliography is normally a single list of all sources arranged alphabetically by the last name of the author or editor. If a source does not have a named author/organisation, list it by the title (ignore articles such as a or the). If a source has multiple authors list all names, regardless of how many. List the surname first for the first author, but the first names first for the other authors. The first line of notes are indented; all following lines are flush left. Bibliography entries have a hanging indentation - the first line is flush left and following lines are indented. For more detailed advice refer to A Manual for Writers of Research Papers, Theses, and Dissertations by Kate L. Turabian. The order of elements in parenthetical citation style generally follow author date, e.g. (Smith 2011). If you quote or cite specific sections of a source, include page numbers separated by a comma, e.g. (Smith 2011, 21).